Product Features | Trench'N edge. The Trench'N edge Landscape and Irrigation Trencher virtually eliminates the high cost of cleaning up trenched material from lawns and planting beds. This revolutionary trencher blows the material directly onto tarps for easy disposal. 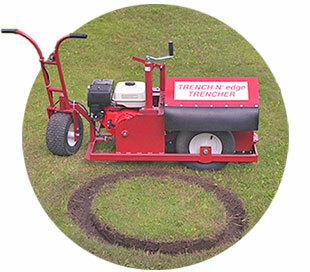 The Trencher was specifically designed for the landscape installation and maintenance industry. This portable, cost effective trencher allows the easiest way to install all types of landscape edging like stone, brick, plastic and modular concrete edging like SELECTedge border stones.